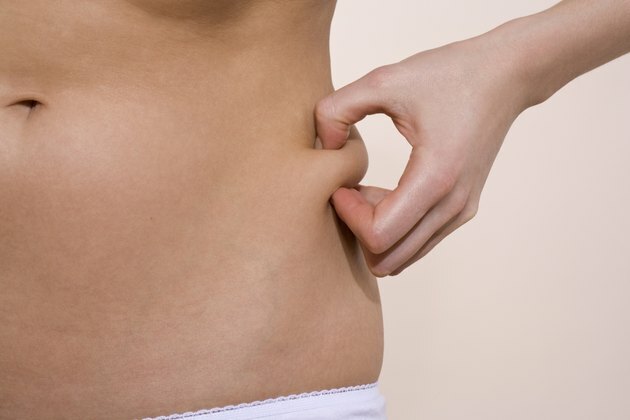 Losing belly fat cannot be done with just exercise. You must create a caloric deficit daily, by reducing your calories to help burn fat. The Centers for Disease Control and Prevention suggests cardio training most days of the week for 30 minutes to lose weight; however, adding a five-minute abdominal routine after your aerobic training can help you lose more belly fat. You can also complete several five-minute workouts throughout your day to banish your belly fat. Cardio training scorches calories and promotes fat loss from your entire body, including your abdominals. The American Council on Exercise suggests that the most effective way to cardio train is to train with intervals. Interval training burns more calories than traditional cardio in a shorter amount of time. Interval training requires short bursts of high intensity followed by a recovery period. You can complete five rounds of intervals in five minutes. Choose a cardio exercise, like running high knees. Run high knees in place for 30 seconds at a high speed and slow your speed for 30 seconds. Repeat this interval for five minutes to burn calories and melt belly fat. Pilates was created to elongate and strengthen the muscles of your body. You can create lean muscle in your midsection and lose your belly with Pilates training at home. Pilates moves like the scissor kick and rollups are all designed to tighten your midsection. Scissor kicks are performed lying on your back with your neck relaxed on the floor. Lift your legs up, allowing your toes to point to the ceiling. Slowly lower your right leg until it hovers above the floor and lift it back to center. Slowly lower your left leg. Alternate legs, completing three sets of 20 repetitions. Complete rollups by beginning on your back with your legs extended and your arms above your head. Slowly lift your arms up and roll your back up off the floor, using the strength of your abdominals. Let your hands touch your toes, folding over your body and slowly lower back down. Yoga can also help define your midsection. Yoga uses your own body weight for resistance, allowing you to build strength in your core. The "Yoga Journal" explains that poses like plank and side plank can help develop the obliques, transverse abdominals and the rectus abdominus. Hold each yoga pose for 30 seconds and build your way up to a minute with proper form. Complete a plank by beginning at the top of a pushup. Your hands are directly under your shoulders and your back is flat. Draw your navel in and hold your pose. Begin your side plank by starting in plank pose. Slowly transfer your weight into your right hand and right foot and stack your hips. Hold this pose, keeping your abdominals engaged and hips lifted off the ground. Consider monitoring the foods that you eat when trying to lose belly fat. You can exercise, but if your diet is high in calories, you may not see any results. Choose to consume foods that fuel your body and keep you feeling full, which prevents overeating. Lean meats, whole grains, low-fat dairy products, fruits and vegetables are encouraged. Processed foods, fast food and soda should be consumed less often.